Potholes sometimes referred to as chuckholes can be the cause of serious trip-and-fall accidents. It is not uncommon for lawsuits to arise from such accidents, even wrongful death lawsuits by head injuries. It is therefore extremely important for private and public property owners to repair any potholes and to maintain the condition of their pavement. 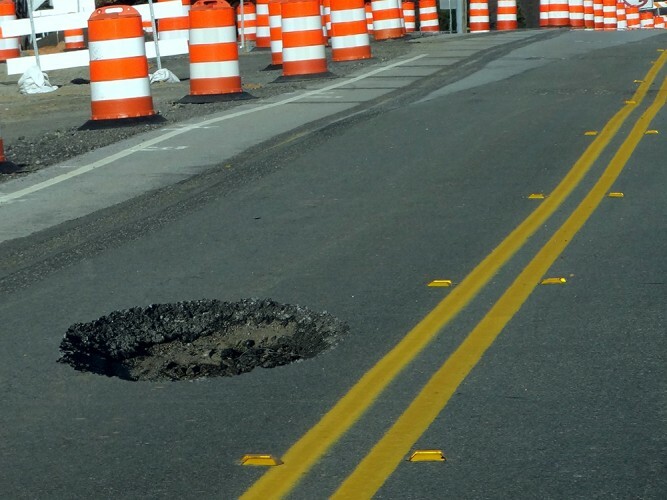 Especially common in the winter rain or snow season, potholes are caused by the expansion and contraction of water that has entered the ground under the pavement. The pavement then collapses when vehicles pass over the weakened spot, creating a pothole. Temporary patches utilize a “throw and roll”method that is a quick and less expensive solution. A hot or cold asphalt patch material is placed in the pothole and is then compacted with the wheel of a vehicle or by hand tamping. Semi-permanent repair requires the removal of debris from the pothole and making clean cuts along the patch area. Hot or cold asphalt patch is placed in the pothole and is compacted with a vibratory plate or roller. Aegis Asphalt in Eugene, Oregon can help repair potholes in your residential and commercial driveways, parking lots, roadways and sidewalks. Contact us today!